In celebration of 18 years of promoting human rights fieldwork for law students, the Ateneo Human Rights Center, in partnership with the Friedrich Naumann Foundation (FNF), launched Remembering Still: Interns’ Reflections on Alternative Lawyering in the Philippines at the Ateneo Law School on 8 August 2006. The book is a compilation of essays on lessons learned from law students’ immersions in fringe sectors of society. These experiences include: interning with environmental organizations, living with minority groups, and giving legal assistance to farmers and laborers. “More than one author writes that being an intern has opened her eyes and widened her horizons,” said FNF Resident Representative Dr. Ronald Meinardus in his message of support. “The sharing of these existential and philosophical experiences by the young human rights lawyers makes this book an exciting read,” he concluded. 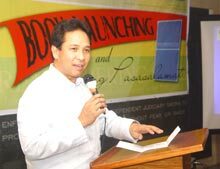 “Short and sweet, and straight from the heart,” added Ateneo Law School Dean Cesar Villanueva, who joined the launching and was full of praise for this educative program. To date, the Ateneo Human Rights Center has produced 572 interns from seven law schools from various parts of the country. A number of the interns have chosen to make alternative lawyering their career — either working with legal non-governmental organizations, or assisting in replicating the Center’s internship program in other law schools. If you wish to avail of a free copy of the book, please send an e-mail together with your mailing address to: liberal@philippines.fnst.org.